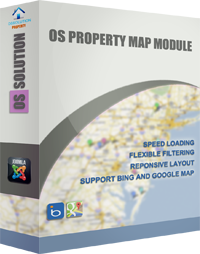 OS Property Map is one of great OS Property modules. It’s the most powerful, simple and usable way to show properties on Google Map or Bing Map on your site. This module provides the new Google/ Bing Maps design, multiple maps, custom markers and a great user interface. Our goal is to provide the functionality you need and show just the correct amount of properties as configured.